A 5 piece set of professional high quality life sized adult realistic severed body parts prop decorations. Each piece is made with poly-foam filled thick rubber latex that's been gruesomely, but realistically sculpted to look like they came from a tortured soul. Oh! The horror! These 5 severed flesh and blood colored human body parts limbs are truly gory, as the mangled bloody bones and muscles are exposed and sticking out of the skin. 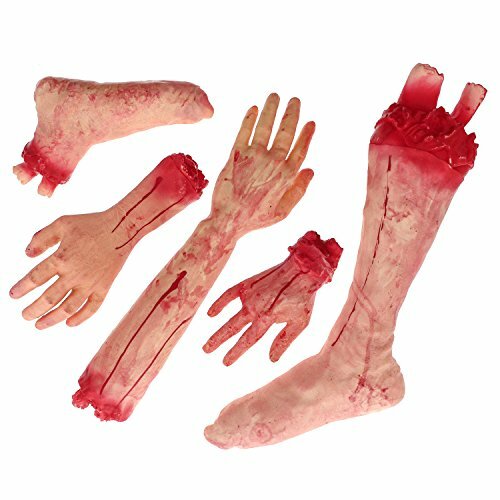 This scary set includes a severed leg with foot (20"), severed foot above the ankle (13"), 2 severed arms with hands (18" & 12") and a hand severed at the wrist with missing severed finger (9"). These body part props are ideal for use at Halloween parties, playing April fools day pranks, performance stage props or placed anywhere and anytime you want to scare someone. They're a perfect addition to any horrifying haunted house, graveyard or entryway, as it adds a little more fright to the trick-or-treaters night! A 5 piece set of professional high quality life sized adult realistic severed body parts prop decorations. Each piece is made with poly-foam filled thick rubber latex that's been gruesomely, but realistically sculpted to look like they came from a tortured soul. Oh! The horror! These 5 severed flesh and blood colored human body parts limbs are truly gory, as the mangled bloody bones and muscles are exposed and sticking out of the skin. This scary set includes a severed leg with foot (20"), severed foot above the ankle (13"), 2 severed arms with hands (18" & 12") and a hand severed at the wrist with missing severed finger (9"). These body part props are ideal for use at Halloween parties, playing April fools day pranks, performance stage props or placed anywhere and anytime you want to scare someone. They're a perfect addition to any horrifying haunted house, graveyard or entryway, as it adds a little more fright to the trick-or-treaters night!